Ten Image is one of the most prestigious brands in the Spanish beauty industry. The brand was created by Cazcarra Image Group, an enterprise that was founded in 1985 by makeup artist Carmen Cazcarra and that soon became the most important beauty academy in the Country. The rapid growth of this business allowed it to invest in producing a complete range of makeup to cover every corner of the market, from trendy consumer oriented lines to the most demanding sectors such as speciall effects for theater and film. 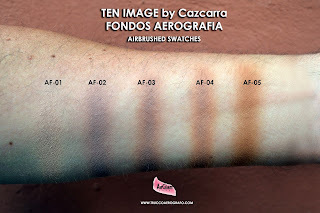 Of course airbrush makeup could not be missing from such an extensive catalogue of products. 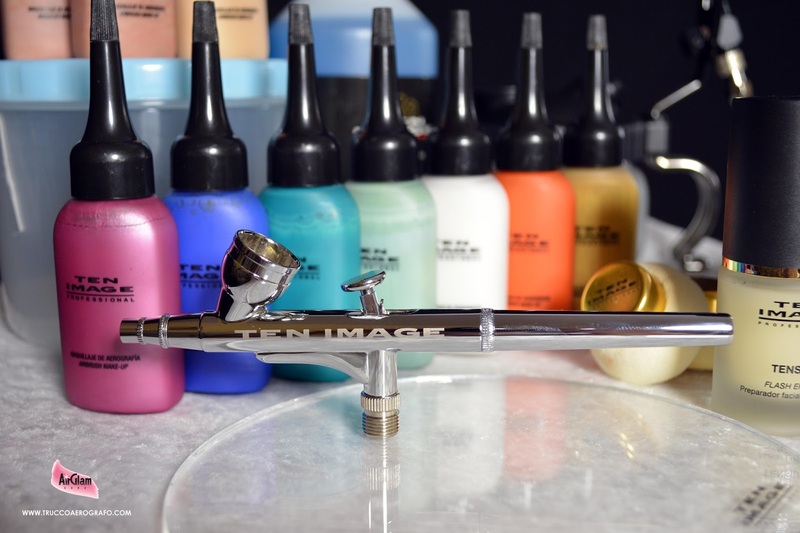 After seeing Ten Image products at several editions of Cosmoprof, I couldn't wait to have the opportunity to test the airbrush lines and the kit being offered by this company. I purchased my kit from a European distributor, and I was pleasantly surprised by the quality of the instruments and the wealth of extra items that are most welcome additions to it. The compressor included in the kit is the very reliable DAC 25 by Sparmax, which is also the choice of many among the best makeup brands. The machine is very small and very quiet, yet powerful with a maximum output of 30 PSI. It can be powered from the mains or from a rechargeable battery pack, which is included together with a very handy, small carrying bag that you can wear attached to your belt of with a soulder strap. The bag provides space compartments for the compressor, the battery pack and an additional battery unit that you can purchase separately. You will be able to complete a full body makeup on one charge of the batteries, but you may need to include and extra one or simply to plug in the unit if you are going to work on multiple people or to execute more taxing tasks such as body art. The airbush included in the kit is the Sparmax SP 35, also a classic shared by the best brands for its reliability and its nozzle of 0.35 mm that allows you to apply any type of airbrush makeup. The airbrush comes with a classic double action valve, which was switched by us immediately for a more convenient continuous airflow one. The kit also features a connector with a pressure regulator. This is a very important feature overlooked by some other brands offering the same equipment. Given the compressor's output the ability to lower the pressure for more delicate areas and finer work (such as eyeshadow) is crucial. Also by Sparmax is the cleaning station that comes with the kit, provided here with two extra filters and a very practical plastic container that allows you to pack the jar without having to empty it if you have to clear your station in a hurry. Other extra item featured it the bundle I purchased were a plexiglass palette, two foam applicators and most importantly a 500 ml bottle of alcohol based cleaning fluid. The product is very effective, leaving the airbrush clean and releasing a pleasant scent that does not linger for too long. Also provided were two more makeup items for Ten Image that I very much appreciated: a peach tone corrector and more importantly a bottle of Tensum, a very good, silicone free primer with a soft focus effect that you can see in action in the video. 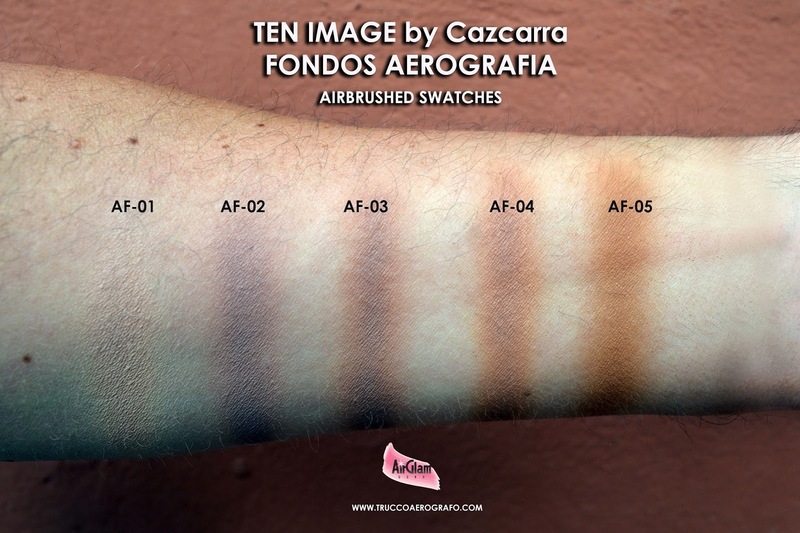 Ten Image features eleven recently reformulated foundation shades and thirty more matte and shimmer colors for any application. All the makeup is water based, and the colors come in a generous 30 ml format. The foundation colors are very easy to apply and very comfortable to wear. The offer great coverage and above average resistance to water. 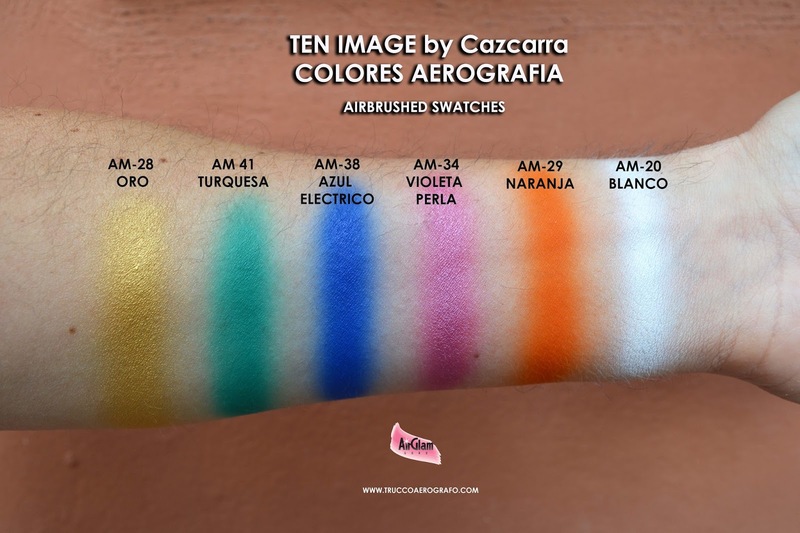 The hues are perfect for the Latin and mediterranean skin tones for which they were originally designed, but easily adjustable to match any other tonality. The other colors impress us for the richness of their pigments. Some of them, such as the beautiful turquoise AM-41, must be applied in extra thin layers to avoid excesses. The shimmer colors have a spectacular finish, and can of course be mixed with any other, creating endless possibilities ranging form the most natural bridal looks to the most daring body art. 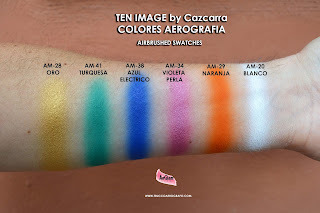 Scroll down to see a few swatches of the colors we used in our video tutorial As always you can click on the images to view them in full screen mode. You can find the Ten Image products on the Spanish website of the company, or through their international distributors such as their Birtish branch. As this is a professional line you may have to register to view the prices. To request information from outside of Spain you can write an email to international@cazcarra.com The very nice memebers of the Ten Image team speak English and will be happy to help you. Please check this newly released video to see the step by step tutorial for the first look we created with these product. The makeup that I created with my collaborator Angela Rosa is directly inspired by the collection released by Ten Image for summer 2016 by the name of Mediterranean Soul, and by the colors chosen by their Creative Director Jordi Justribò. Foundation Ingredients: Aqua, Talc, Propylene Glycol, Glycerin, Phenxyethanol, Caprylyl Flycol, Magnesium Aluminium, Silicate, Ethyliexigliceryn. Pigments. Other Colors Ingredients: Water, Clacium Carbonate, Paraffin Wax, Petrolatum, Dextrin, Glycerine, Stearyl Alcohol, Acacia Senegal, Sodium Benzoate, Perfume, Pigments. 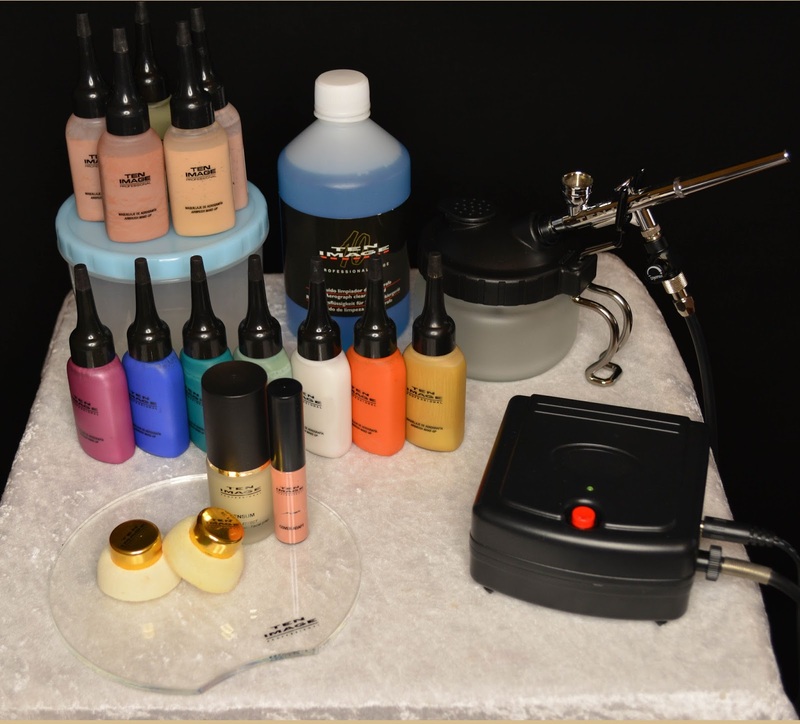 the airbrush makeup courses is the best training .airbrush summer look is the perfect . water based airbrush makeup professional courses.